In September 1915 and subsequent months local papers in Wales carried a number of stories about the fighting in Gallipoli and letters from soldiers in the 4th Welsh. The Cambrian Daily leader of 18 September 1915 printed an article headed ‘How 4th Welsh sailed – story of the voyage and baptism of fire – shells for breakfast’ including a long letter noted as having been ‘Passed by Censor’ from Gunner R Frederick Thomas, of the Machine Gun Section, 1/4th Welsh, attached to the Cheshire Regiment, from Llandovery, describing the journey from Bedford – which they left on 6 July, via Malta, Alexandria, Port Said and Lemnos eventually to reach the Dardanelles, landing on 9 August – and the hard reality of battle and life under fire. 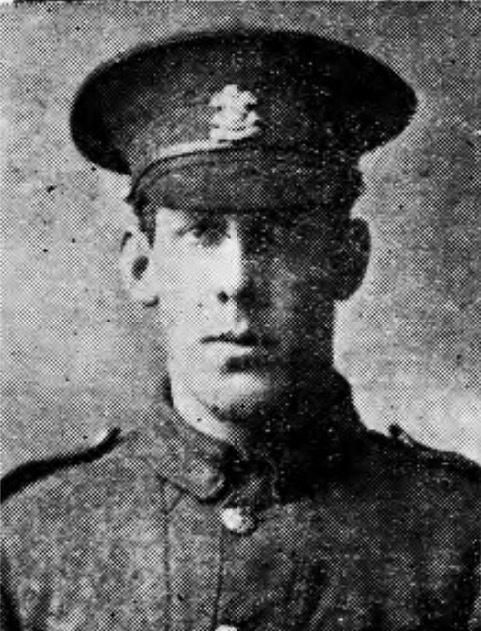 Lieutenant George Adams (below) from Haverfordwest also gave his impressions of the campaign in the Haverfordwest and Milford Haven Advertiser of 24 November 1915. He described an occasion when the Turks had disguised themselves as Gurkhas. An officer spotted them and shouted ‘they are Turks, there are no Gurkhas near here’. Instantly the enemy heard this, they shot and killed Lieutenant Adams’ friend and turned and fled back towards their trenches. But not one reached them, all being shot dead before they had gone many yards.